In the true spirit of Thoroughbred racing, The Thoroughbred Center provides a superb adventure. Whether you are simply passing through Lexington and the Bluegrass, visiting on business or reside here, The Thoroughbred Center has a lot to offer. Nestled among the rolling hills of the Bluegrass, we offer an exceptional meeting site, advantageous location, informative and fun tourist activities, convenient parking, and an experienced staff to assist you with all of your planning stages. The Thoroughbred Center is located in the heart of the Bluegrass in Lexington, Kentucky. Just 2.5 miles from Interstates 64 and 75 (and only 5.5 miles from downtown Lexington), the Center is an ideal facility for all kinds of business and social functions. The Paddock is our newest event space that debuted in May 2016. Surrounded by a white barn, this lushly landscaped courtyard is the perfect site for your outdoor wedding and reception. An adjoining ceremony site is like a secluded garden overlooking neighboring horse farms. Our indoor amenities include men’s and women’s restrooms, dressing rooms, prep kitchen and bar. 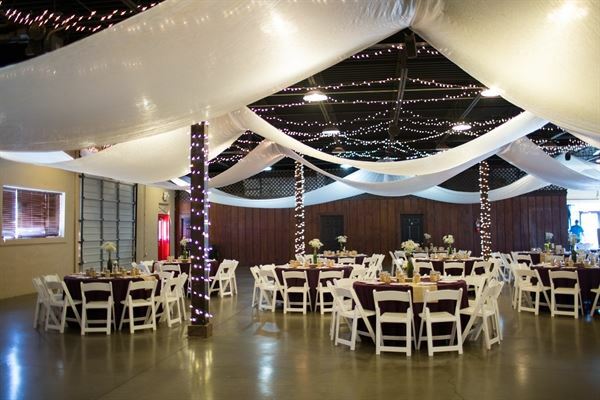 A 40' x 60' white top tent is included in the package price for your convenience. Seats up to 200. The Horseman's Lounge is 2400 square feet of elegance and flair. Complete with its magnificent chandelier, hardwood dance floor, adjoining kitchen, and a bar and beverage service, this room is ideal for banquets, weddings, wedding receptions, formals, proms, school parties, company parties, trade shows, and small business meetings. This room comfortably seats 150. Stableview Hall, which has become our most popular space, easily accommodates 300 people seated, and features festive twinkle lights across the ceiling. A unique and rustic area, the casual barn-like atmosphere, clearly defines the Center’s central location in the heart of the Thoroughbred industry. Supplied with a bar, restrooms, prep kitchen and dressing rooms, Stableview Hall has become the best facility around for weddings, sorority/fraternity parties, barbecues, reunions, company parties/picnics, and many other social events. This 8800 square foot space is ideal for your special event. Seats up to 500. The Thoroughbred Center and its professional staff of planners cater to the success of their clients and visitors by providing a feeling of hospitality and comfort. Whether here on business or pleasure, the Center is the ideal location in a city known for its diversity and charming traditions. Includes: - 3 Hour Set-Up Time - 4 Hour Event - 1 Hour Breakdown/Clean-Up - 10 5' Round Tables - 100 Chairs - 2 8' Banquet Tables - 1 6' Banquet Table - 1 4' Round Table - Outside Catering Allowed - Security for 5 Hours The Horseman's Lounge: 100 Guests - $950 120 Guests - $1,050 150 Guests - $1,300 180 Guests - $1,425 The Stableview Hall: 100 Guests - $1,200 150 Guests - $1,550 200 Guests - $1,750 250 Guests - $2,100 The Paddock: 100 Guests - $1,425 120 Guests - $1,500 150 Guests - $1,775 200 Guests - $1,975 *$230 Damage Deposit required. Includes: - 6 Hour Set-Up Time - 5 Hour Event - 1 Hour Breakdown/Clean-up - 10 5' Round Tables - 100 Chairs - 2 8' Banquet Tables - 1 6' Banquet Table - 1 4' Round Table - Short & Floor Length Linens - Cash Bar - Outside Catering Allowed - Security for 6 Hours The Horseman's Lounge: 100 Guests - $1,550 120 Guests - $1,650 150 Guests - $2,100 180 Guests - $2,250 The Stableview Hall: 100 Guests - $2,075 150 Guests - $2,625 200 Guests - $2,875 250 Guests - $3,450 The Paddock: 100 Guests - $2,425 120 Guests - $2,525 150 Guests - $3,025 200 Guests - $3,325 *$250 Damage deposit required. $3,825 - $6175 - 9 Hour Set-Up - 6 Hour Event - 1 Hour Breakdown/Clean-Up - 10 5' Round Tables - 100 Chairs - 2 8' Banquet Tables - 1 6' Banquet Table - 1 4' Round Table - Floor Length Linens - Open Bar - House (4 Hours) - Outside Catering Allowed - Security for 7 Hours The Horseman's Lounge: 100 Guests - $3,825 120 Guests - $4,300 150 Guests - $4,450 180 Guests - $6,175 The Stableview Hall: 100 Guests - $4,650 150 Guests - $6,275 200 Guests - $7,500 250 Guests - $9,125 The Paddock: 100 Guests - $4,875 120 Guests - $5,350 150 Guests - $6,425 200 Guests - $7,725 *$250 Damage deposit is required. This equestrian-themed, formal lounge is 2400 square feet of elegance and flair. Complete with its magnificent chandelier, hardwood dance floor, adjoining kitchen, and a bar and beverage service, this room is ideal for banquets, weddings, wedding receptions, formals, proms, school parties, company parties, trade shows, and small business meetings. This room comfortably seats 150. The Center’s sales pavilion, or 920-seat auditorium, was originally built for horse auctions with the idea in mind to accommodate conventions, corporate meetings, conferences, seminars, concerts, theatre productions, fashion shows, wedding ceremonies and other social events. This theatre-style auditorium offers a relaxing and spacious atmosphere with its red velvet chairs and double-wide aisle ways (handicap accessible). A 60' x 20' stage, enhanced by a 24-channel sound system, is also available. The Runway, located at the back of the pavilion, is ideal for registration, videographers, photographers, or other set-ups as needed. Stableview Hall, which has become our most popular space, easily accommodates 300 people seated, and features festive twinkle lights across the ceiling. A unique and rustic area, the casual barn-like atmosphere, clearly defines the Center’s central location in the heart of the Thoroughbred industry. Supplied with a bar, restrooms, prep kitchen and dressing rooms, Stableview Hall has become the best facility around for weddings, sorority/fraternity parties, barbecues, reunions, company parties/picnics, and many other social events. This 8800 square foot space is ideal for your special event. Seats up to 500. The Paddock is our newest event space that debuted in May 2016. Surrounded by a white barn, this lushly landscaped courtyard is the perfect site for your outdoor wedding and reception. An adjoining ceremony site is like a secluded garden overlooking neighboring horse farms. Our indoor amenities include men’s and women’s restrooms, dressing rooms, prep kitchen and bar. A 40' x 60' white top tent is included in the package price for your convenience. Seats up to 200.